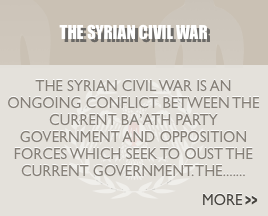 Operation Antioch: The Death of the Antiochian ethnicity in Romaiki Syria. 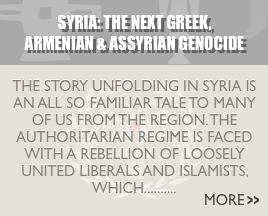 The Death of the Antiochian ethnicity in Romaiki Syria. In 1860, fearing the possibility of a successful uprising similar to the one in Greece, the ruling Ottomans influenced the local Muslim population into attacking the Christian community of present day Syria and Lebanon. There are several reasons for this assault. The Ottoman powers had been compromised by many outside forces, such as the imperial powers of Europe and Russia, who wanted to trash the empire, but not, in a way, that would hurt European interests. By the time of the attack the Ottoman Empire was called “The sick man of Europe” due to its demise. When the massacres, which started in present day Lebanon reached the Christian quarters of Damascus, over 10’000 Antiochians were forced to give their lives for the crime of simply being Roum. The Ecumenical Patriarch of Constantinople of this time was an Ottoman appointed ruler over the Rûm-Millet (Governor over the Eastern Roman Nation). This Patriarch, in turn, was given the right by the Ottoman Sultan to appoint the Patriarch of Antioch. The very same Patriarchate, which openly opposed the Greek nationalistic movement when Greece broke free from its Ottoman occupation. This was mainly by the Revolution’s loss of power for the Phanariote Patriarch over his people. The Phanariots were Greek merchants from Phanar, who had risen to power in the Ottoman Empire, and were keen on keeping the power they had acquired over their enslaved brethren by slowly corrupting the seat of Constantinople. It was in the Ecumenical Patriarch’s interest to appoint a patriarch of Antioch loyal to himself, and the Phanariote clan. The Antiochians were not able to appoint their own Patriarch, a national leader due to Constantinople’s corrupt veto. These realities, plus the retaliation of the Ottoman authorities for the liberation of Greece, created hostility among the now, mainly Arabic-speaking Antiochians towards the Greeks of the motherland. Antiochians, knowing they had no allies in their cause for liberation (contact with Greece went through proxy, via the Ecumenical patriarch), created a strategically brilliant plan, at the time, to create a local ally with whom they would break free from the Phanariots and Ottoman rule. Together with moderate and secular Muslims they perfected an ideology, which had been promoted by the western Europeans in their attempt to overthrow the Ottoman Empire. This simple idea, “Arab Nationalism” defined an ”Arab” as “Arabic speaking person living in the Middle East” and took no notion of ethnic or religious preferences. This master plan proved effective and with the support of the western powers, “Arabs” were now rising against Ottoman rule, and creating a state of “Greater Syria," which included the modern day Hatay province, Lebanon and parts of Palestine. Russia being a part of the European powers, with interests in conquering Constantinople and placing it under Russian, not Greek control, supported this Arab movement in full and became the protector of the Patriarchate of Antioch. Without Russian support, the Arab Nationalist Patriarch could have never been elected in 1899 (Meletius II). The Ottoman alliance with the Axis powers was their final strike, and in the aftermath of WWI new “Arab” states arouse, Syria, Jordan and Iraq among others. Division among the Antiochians did not end there. There were several due to the competing interests from European imperialists, which divided Antiochians into four different states. Syria, Turkey (Hatay/Alexandretta, even the Cypriots were originally part of the Antiochian See), Lebanon and Palestine. The majority of the remaining Antiochian Greeks fled to Syria due to the ongoing Genocide under the swords of the “Young Turks," Turkish nationalists, extermination over a million Ottoman Greeks, one and a half million Armenians, one million Assyrians and Syriacs and other Christian minorities. Today many Antiochians in Lebanon and Palestine have already rejected the Arab ethos, while in Syria, where martial law has been in effect since 1963. People do not speak of ethnicity in fear of being seen as opponents to the ruling Baath party (which is an Arab Nationalistic party) or targeted as non-Syrians. In Turkey, anything opposing Turkish nationalism is considered treason, and the Antiochian Greeks are often called Christian Arabs or Christian Turks or even nomads. Occupied Cyprus were a large number of Antiochian live, is still considered Turkish soil with a Rûm-Millet, although they have already gained sovereignty and freedom, as an independent Greek State. The Antiochians of Lebanon and Palestine are rediscovering their true ethnicity, the Eastern Roman-Greek ethnicity, and why should they not? These Asian Greeks have given the world one of its largest philosophical and religious legacies, the Greek Orthodoxy (Eastern Orthodoxy or Byzantine Orthodoxy if you prefer). With the power of the Internet, today, it is hard to conceal and censor facts, and the Antiochians of Syria are slowly reawakening when they find unbiased facts. They are discovering that their alliance with the Muslims under the Arab movement is failing due to being targets of groups like Al-Qaeda and ISIS. Antiochians in Syria are not only Greek Orthodox and Melkite Christians, but also Muslims. The ruling Alawites are nothing more than Islamized Antiochian Greeks, and form a natural community with the Christian Antiochians. The Alawites have a rich history as well and need their own “short story”, but should be considered as full members of the Asian Greek ethnos as the ethnicity is still called in Arabic (Rûm, means Eastern Roman and is synonym with Asian Greek). How can Antiochians still be Asian Greeks and not Turks or Arabs? Under Arab rule (ca 630 – 1453) Christians were not to practice their religion in public, and not allowed to convert Muslims to Christianity. Christian men were also not allowed to marry Muslim women. Muslim men were allowed to marry Christian women, but were forced to raise their children as Muslims. These same laws were applied under the Ottoman Caliphate. The crime of converting a Muslim came with capital punishment. There was, and has always been a Christian-Arab minority under the see of Antioch, but these people should be considered fully integrated with the Greeks of Antioch. Although, since they have lived in under the same difficulties, persecuted by Muslim Arabs, and today are fully adopting the Hellenic culture. They too should be accepted as Asian Greeks. There are also western Arameans and Syriac/Assyrian minorities, but majority have always been Asian Greeks. The majority of the Syriacs formed after a schism in 451. AD their own church and kept their own ethnos. Even after Arab and Ottoman occupation, the Antiochian Greek Church that was given right to act as the civil court over its people, never allowing marriages between other Christians from the Levant. If this was in order to protect the ethnos or theology, only the church can answer. In later years since, there have been trials of uniting the different Churches split from the Patriarchate of Antioch, some marriages between the different Christians have been approved. In the aftermath of the massacres of 1860 many Antiochians saw no end to the 1500 years of persecution and decided to emigrate. Many came to the United States, where they could practice their faith under the freedom of the U.S. constitution. These Antiochians have been described as such: “Assimilation of early Syrian immigrants was so successful that it has become difficult to recognize the ancestors of many families which have become completely Americanized." Those who remained in close connection with their heritage and married according to church rules have not become Anglo-Saxons or Hispanic despite their political views and linguistical preferences. They are still Antiochian Greeks, and so are those who chose Arab ideology and an Arab mother tongue.